Which type of bow sight for you? What makes the best single pin bow sight? Skills are important, but it’s not enough without good gears. And a must have item is best single pin bow sight. This item is quite similar to a scope, mounted on your bow to help you aim better than before. This bow sight works like views on guns, which offers you a better view to aim and enhance your control on your shots. Of course, you can shoot without this gadget, but it will be tough for you when shooting from long distance. With the best single pin bow sight, your skill is enhanced like buff. And along with your instinct, you will be confident to shoot from any distances. There are a few kinds of bow sights. However, usually, people consider between two main types are single pin bow sight and multiple pin bow sight. Depend on your personality and hobby, you can consider between two of them. Like its name, you will have around three to six pin on the scope which is fixed. Let’s say you have five pins then you can set each pin at 60, 50, 40, 30 and 20 yards. Now, each pin is meant for different distance to make an accurate shot on your target. With this, you can aim low or high rely on a proper pin for each range to hit the place you want. It is important to choose the precise pin for your shooting distance wisely. In opposite, you will have only one pin to adjust. You can move it up and down due to the distance you are shooting and set it in the right spot you want. There is a sticker marked or strip of a ruler for the different distance on sight. You can adjust the indicator there to the distance you are shooting then, your sight pin will change accordingly. For single pin bow sight, you don’t have to choose anything, and you cannot miss to another pin. Place the pin to where you want to hit then you are ready to go. Some archers also think the single pin bow sight offer a cleaner view so they can take the shot easier without distracts. With a single pin, your shoot is always placed at where you pinned, and you don’t have to guess at all. In the other hand, multiple pins bow sight offers you various shots from different distance. For example, your target show up at 20 yards then it suddenly changes to 30 before you can take the shot. Now, you just have to aim with higher pin without physically change anything to miss the shot. The multiple pins bow sight can also act like a rangefinder if you are familiar with this scope. With a single pin, you just have one point to aim. If you target moves at your full draw, then you have to release your string. After that, adjust your sights which could make you miss the best moment. Or you can bet your shot with high or lower aim. Moreover, some single pin bow sights have a big button to adjust the pin, and it makes the quiver difficult to be attached. For the multiple pins, the common mistake is you are aiming with the wrong pin. Those pins are close, and it’s easy to forget which pin is meant for what distance. And that’s still lucky if you have your target on one of those pins. Otherwise, you have to shoot by aiming through the gap of them if you target is in the middle. The multiple pins also spread on your view like lines. Some users think it looks like a mess on the viewfinder and hard to focus. With their pros and cons, the single pin bow sight seems more suitable for beginners but pay attention for what you purchase. In some competitions, the adjustable pin is illegal, and of course, you don’t want to compete with only one aiming distance, do you? From the beginning, it could be a bit complicated to use. Then, the best single pin bow sight can be indeed easy and straightforward after you are familiar with it. If it’s too difficult to adjust, you can easy to miss your shot at the perfect moment. You also need to place your sight tape precisely and correctly to make sure you have a good shoot. This factor is the reason why you should buy this tool and need it precise as possible. The better accuracy, the closer you get to the bullseye of your target. However, it’s not fair to say all of the precision of your shot are depended on this tool. Therefore, you need to improve your skills and learn to calculate your shoot too. This thing is in front of your view and helps you aim precisely. Hence, you will want it as small as possible. It also covers less view and offer you a cleaner view and easier to focus on your target. If you are hunting on a low light situation, an attached light on the single pin bow sight would be helpful. Some fiber optic pins can also provide the light. Remember that a vibrant-colored and bright fiber optic pin is the key to help you increase your view at night. The Trophy Ridge one pin bow sight is designed for right handed users. Trophy Ridge includes a “smart pin” technology in this tool so as to increase precision. This bow sight is made from aluminum completely, and their system offers advanced accuracy for far distance shooting. When you are in the hunt or competition, the slight tape has a helpful stop at 20-yard mark to make it fast to trace target. This bow sight is really flexible with many mounting holes to attach and a yardage ruler between 20 to 100 yards. With a big viewfinder of this bow sight, you will have a clear view of your target to aim better. Also, you have only one single pin to decrease sight clutter and sightless spots. 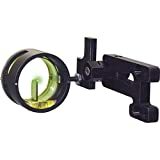 Moreover, this best single pin bow sight installs a green center dot, which is meant to improve the accuracy of long distance. All you need to do is pointing the dot to the mark on the distance sticker then change it to match the target distance. The adjustment is based on distance and light and works well in low light. You will get 11 level of brightness to set up due to your condition. 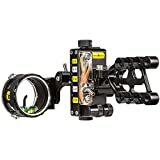 This bow sight can be attached to both left and right handed so it’s quite convenient to share with your partners. You also get an extra yardage sticker for longer range when buying this bow sight. Well made from 100% aluminum, this single pin bow sight is really strong and solid, offers you no vibration when shooting. It’s sturdy and can go with you for a long long time for many hunts. It could be complicated for you at first set up then after getting used to it, you will love this. You can easily adjust it by setting up your baseline for the distance you want. A tip is to take advantage of the installation process, or there are many videos on YouTube about how to handle this bow sight. Additionally, this single pin bow sight is installed the new pin technology ARMOR, which helps to increase your accuracy when shooting via pin gap. You can also enhance your vision by zooming in or out by the lens to lock your target when it’s far from you. This product is tough and strong, with a sharp look to give you the feel of a durable and finished product. It’s a bit heavy to move around when you are on the hunt but the accuracy and precise is good in return. A little note is that this bow sight is made to fit right-handed users. When you adjust the pin, the buttons work smoothly and silent without vibration and noise to keep you concentrated. 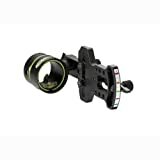 Moreover, the pin size is really small (0.019 inches) which make your view clear and increase your accuracy of your shot. You can also choose the color of a pin in order to aim better and clearly lock your target behind your tiny pin. 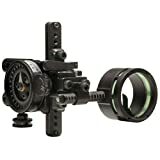 This single pin bow sight is so cheap that you cannot believe in your eyes. Less than $30 for a bow sight but it still works great and improves your hunting game. This bow sight is made from aluminum with a 2.25” lens. For the pin, a green fiber is using to make you easy to see it in low light. You can also use it for both left or right handed. It is such a truly good deal for those who like minimalist and don’t want to boosts too much for this game. It’s quite simple but give you a good feeling to use your instinct more. When you start hunting or just want to try to be an archer, there are a lot of exercises and triaging you have to do before you can shoot. Sometimes, after a long time of training, it’s not easy for you to shoot precisely and sharp like you see in an old movie. However, thanks to the development of technology, there are best single pin bow sights available now to help you increase your shooting.